Please note: If you are viewing this page with a normal user account the retail price will be displayed. Please login to your wholesale account in order to receive proper pricing! 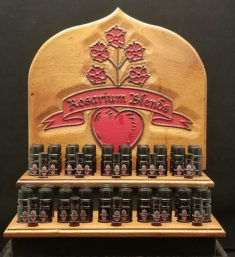 Rosarium Blends offers beautiful displays as an option to their wholesale customers. The displays are an integral part to the success of selling our products as they draw the customer in, whereas often times products are lost in the mix of everything else in a shop when siting on a shelf by themselves. The cost of a display is reduced considerably if you purchase it initially already filled. 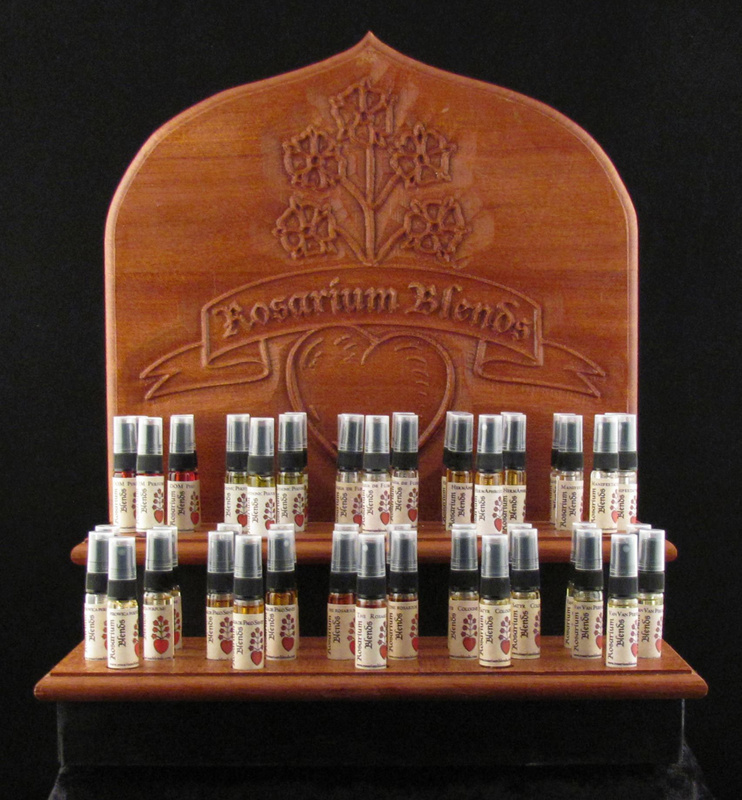 We currently offer two different display and perfume size options for our talismanic perfumes. The Product image shows our atomizer display (4 ml atomizer bottles) and the other image in the gallery shows the alembic (15 ml) bottle w/ atomizer display option. The atomizer filled display comes with 10 different perfumes, 4 atomizers of each for retail sale and a 5th atomizer to be used as the tester (50 atomizers total). The tester atomizers are included with the filled display at no charge when purchased ‘filled’. 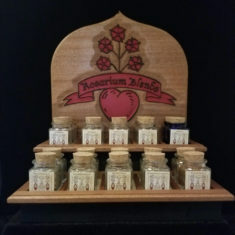 The alembic (15 ml bottles w/ hand stamped wax seal) display comes with 10 different perfumes, 2 bottles of each as well as an atomizer to be used as the tester. The tester atomizers are included with the filled display at no charge when purchased ‘filled’. 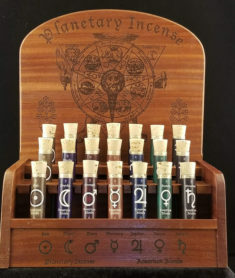 The following perfumes are included w/ the display: Chthonic, Dom, Agua de Florida, HermAphrodite, Manifestation, Agua de Palo Santo, Pirowica, The Rosarium, Satyr, and Van Van. Note: Samples are available to potential retail accounts upon request. Very attractive and functional display. The arrangement of the four bottles behind the one centered bottle for each fragrance lends itself easily to designating testers for each fragrance. 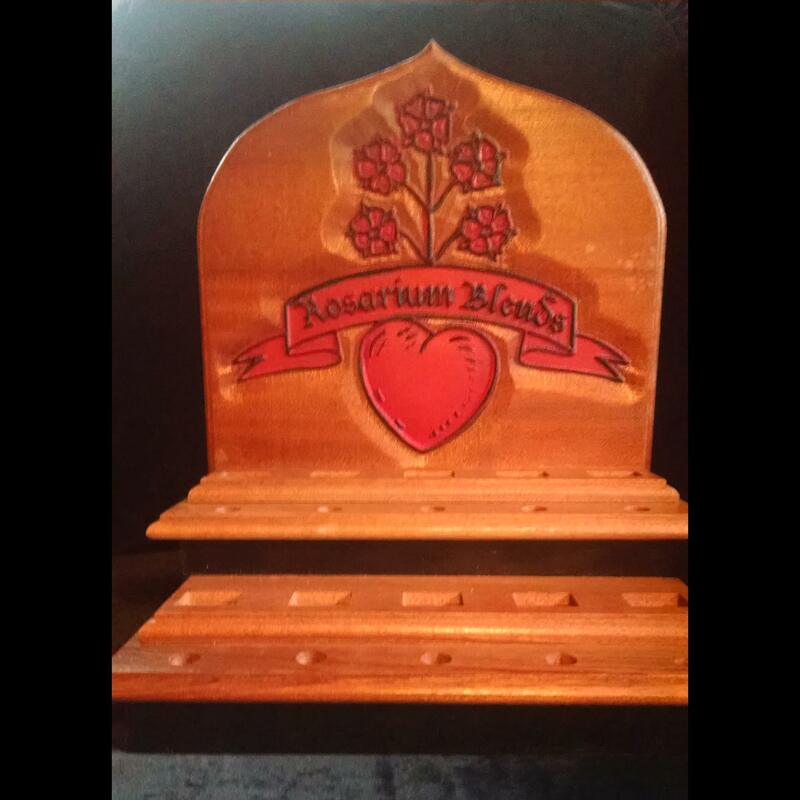 The aesthetic of the Rosarium logo against the carved wood is pleasing to the eye.